If you’re a person who’d been dealing with cars and tires, you might be noticed something printed on the tires. From a bird’s eye view, it looks like a bunch of code with no visual meaning. They look something like P225/45R17 91V. But the truth is, in these numbers and characters, a lot of questions regarding the tire is answered. You can know the type of it, the dimensions and so on. And in case you’re not able to do that yet, we are to the rescue. In today’s extensive article, we have a mission to make these codes crystal clear to you. Stay along and soon it will happen. 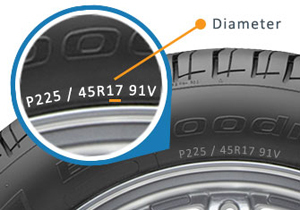 Let’s take the example of P225/45R17 91V as a tire printed code. The first letter P expresses the type of the tire. It’s called the tire metric also. Usually, there are types of tires who are cited as P or LT or many more. When the first letter says P, then it means the tire is of Passenger Vehicle. Cars that are after passenger transport, are of this type. These cars can be a capacity of ¼ or ½ ton. Also, these cars have to be of light duty. And the LT stands for Light Trucks. They have a capacity of ¾ to 1 ton. Some examples are SUVs, heavy-duty pickups, full-sized or medium-sized pickup. There is some more complication with the size citation of Euro-standard codes. But we are keeping this narrow to only US standards. 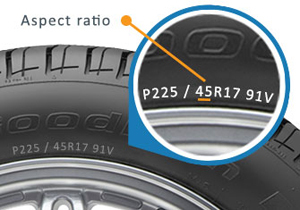 The second part of the code, (225 for example) indicates the width of a cross-section of the tire. And the value is given in units of millimeters. So, our considerable sample has a tire width of 225 millimeters. To measure this value, some precise calculation is done. The distance of the widest point of the internal sidewall and the widest point of the outer sidewall is 225mm. For many of the purposes, this width is important to know. The third part of the code is the aspect ratio. You can find it in the example as 45. Aspect ratio is the division of two values- the sidewall distance and the tire section width. Also, sidewall distances are the distance from the wheel to the rim of the car. This ratio indicates that the car has a sidewall distance which is 45% of the entire width of the tire. The performance of the tire has a direct relationship with the performance. For example, a tire with the low aspect ratio is supposed to be a low-profile carrier. Also, higher aspect ratio means that the sidewall will be taller. Apparently, tires with low aspect ratio will have a short sidewall. And tires with a high aspect ratio would have a higher sidewall. Here comes a letter that shows which type the tire is off. From our example, what comes next is the letter R, and that means the constructional type. R stands for Radial. Which means the layer is settled up radially across the tire. Almost 98% of the tires are made as R-type construction. But there is two more variant of it. They are the D-type and B-type. D-type stands for cars that are of bias ply construction. And B- type is for Belted construction. Each of them has their own functionalities and change in the carriage. 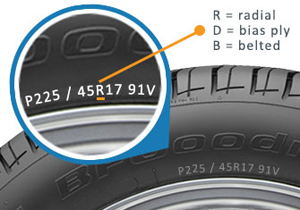 From out example tire, the next two digits are the diameter of the tire. As seen in the code, we find the next two digits to be 17. That means this tire would match a tire of 17 inches in diameter. Apart from this, there are a lot of variations in car diameter. Some of them are- 8, 10, 12, 13, 14, 15, 17, 18, 19, 20, 22, 23, 24, 26, and 28 inches in diameter. These are the tires that’d be used in popular vehicles like passenger cars, light trucks, vans, minivans, SUVs and many more. This part and the part next to it, are unitary information printed in the tire code. But as long as they’re in the code, we’ll explain it all. Except for Z-rated tires, the service description is necessary to be printed on the tire code. You will find it right after the diameter of the tire. In our example, it’s 91. 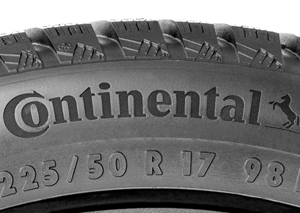 What it means is, this particular tire has a load index of 91 units. The last part of the code is the speed rating, V is our example. There can be two variants of the speed rating. One is V, for regular passenger vehicles, vans, minivans, SUVs, and many others. Other is the Z, which is the only speed rating for sports cars. Thanks for being until the end of this article. For you to understand simple, we’ve kept the entire discussion in US standards. If we come to Euro standards, there are some changes in the way they represent the code. But more or less, the exact type of information is delivered worldwide.